Registration: Conference registration is available through a U of Oregon ecommerce platform. Please be sure also to update your membership in the SEA. As in the past, membership is required for conference registrants. To join or renew your membership in the SEA visit this site managed by the University of North Carolina Press, publisher of the society’s affiliated journal, Early American Literature. Program: The final program for the conference is available now SEA Eugene 2019 program Final. The opening pages of the program include maps and instructions for travel to our meetings at the University of Oregon campus on Thursday. Also, as of Feb. 5th the schedule of sessions on March 1-2 was adjusted to match panels that need screen projectors to rooms at the Hotel which will have this equipment: the Hansberry, Wilder, and Studio C rooms. Every meeting room at the Erb Memorial Union (our Thursday venue) will laptop computers, and buit-in projectors and screens. Please bring your presentation on a thumb drive for easy transfer to the laptop. If you have not yet replied to the earlier request about a/v, contact conference organizer Gordon Sayre with requests for A/V equipment, and again, please consider using paper handouts as an alternative. Update on Travel and Weather: Early in the morning of February 25th Eugene received a major snowstorm, with more than a foot of snow falling across the city, and more in the surrounding hills. Interstate 5 was closed south of Eugene, but traffic continued to and from Portland. Most of the snow should melt in the next 48 hours and roads should be passable by the time you arrive. However, be sure to check your airline itinerary and be sure to back boots and warm clothing to be prepared for snow and slush. Travel Logistics: Make travel plans soon. 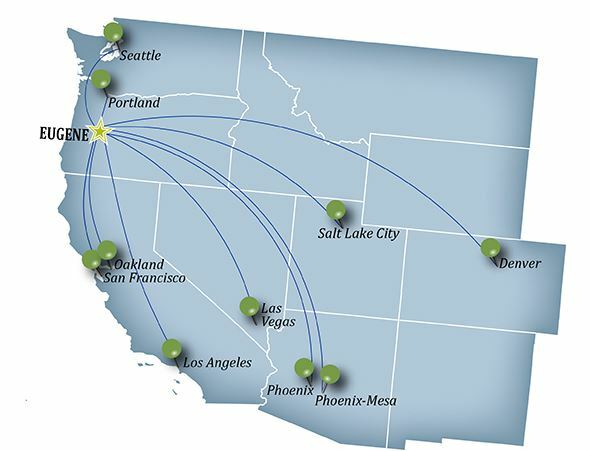 The Eugene airport, Mahlon Sweet Field, uses the code EUG and is served by United, American, Delta, Alaska, and Allegiant Airlines from cities shown on the map below. It is not a major hub, obviously, and fares fluctuate widely, but the end of February is typically a slow period with lower fares. For guests staying at the Hilton Hotel Eugene, a free shuttle service is available to and from the airport. For those staying elsewhere, taxi service costs $20 -25 to central Eugene. Uber and Lyft will be operating in Eugene by the time of the conference. Alternatively, one can fly to Portland (PDX) and reach Eugene by Amtrak train or by bus. Least expensive is the Bolt bus service, which departs downtown Portland for Eugene twice a day for $15 one way. Be aware that to fly back to the Eastern Time Zone and reach your destination by late afternoon requires taking a red-eye or leaving early on Sunday or Monday morning. There are departing flights to Portland, Denver, Seattle, San Francisco and Los Angeles between 5 and 8 am. Conference sessions on Friday and Saturday will be held at the Hilton Eugene. On Thursday, February 28th we will be meeting at the Erb Memorial Union on the UO Campus. 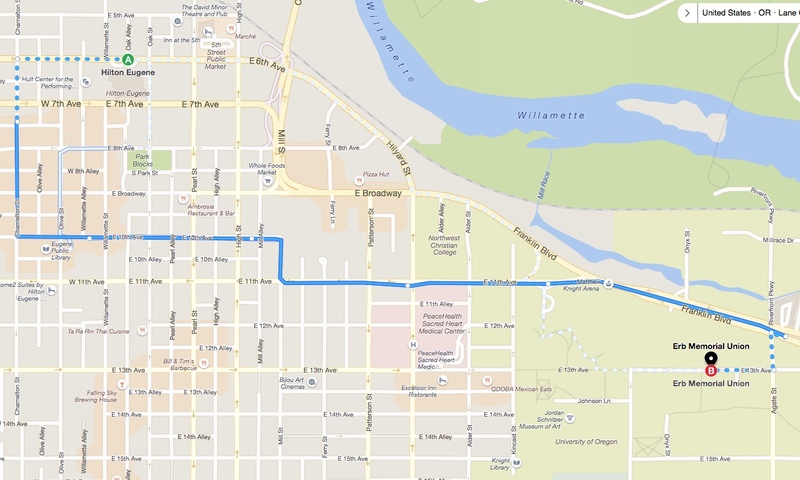 To reach campus from the Hilton one has the option of a half-hour walk of 1.4 miles, or a bus ride on Eugene’s state-of-the-art EMX bus service (route shown on map below). School buses will transport SEA participants in the morning and evening of February 28th. Lodging: The conference hotel, the hotel formerly known as the Hilton Eugene, was recently sold and will be rebranded in mid-2019. Our conference occurs during an interim period during which it will be known as the Hotel Eugene. Room reservations cannot be made using Hilton’s phone banks or website, and SEA members will need to call the Hotel Eugene directly at 541-342-2000 and ask for the SEA conference room block. The room block rate is $139/night, and the conference rate expires on February 5th. Two additional room blocks have been reserved for SEA members. One is at the Phoenix Inn motel, located at the corner of Alder St. and Franklin Blvd, roughly mid-way between the two conference sites. Call 541-344-0001 and ask for the code OSEA. As of January 3rd the on-line booking is no longer available for our room block. The rate at the Phoenix Inn is $109/night and the room block expires on January 27th. The third room block is at the Home2Suites (a Hilton affiliate), which you will find on the left edge of the map just south of the Eugene Public Library. The rate there is $135/night and includes breakfast. Reserve there through this Home2Suites booking link or by calling 541-342-3000 and asking for the Society of Early Americanists block, which will expire on January 30th. Dining and nightlife information is offered through Travel Lane County, the local tourism bureau. There are many brew pubs and tasting rooms featuring Willimette Valley wines. Among cultural activities during our conference are concerts by bassist Stanley Clarke and soul singer Patti LaBelle at separate downtown venues on March 1st, and music all three nights at the smaller venue the Jazz Station. 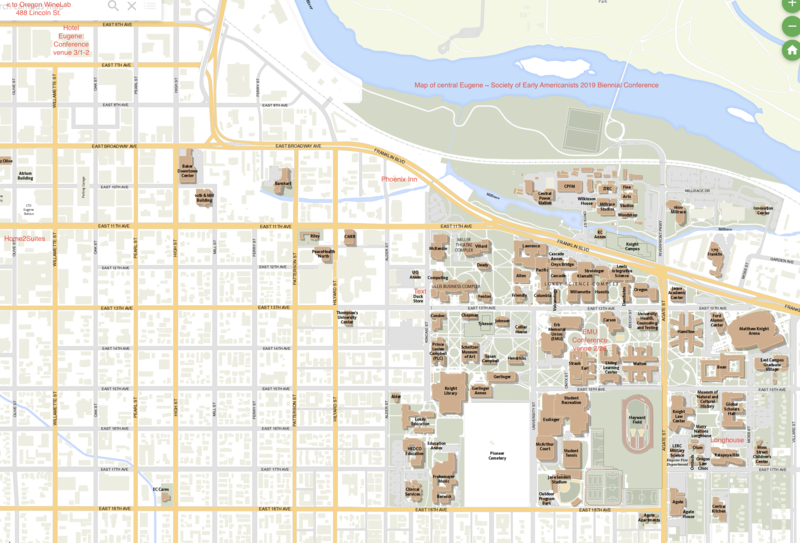 This map is marked with locations of the three conference hotels and the campus venues (the Erb Memorial Union and the Many Nations Longhouse).